Beautiful Bologna is located in the Italian region of Emilia Romagna, a mythical destination for foodies and home to such culinary treasures as Mortadella (from Bologna in fact), Culatello and Parma ham, Parmigiano cheese, Vignola cherries, Balsamic Vinegar (Aceto Balsamico Tradizionale), and extra virgin Brisighella olive oil. Gastronomy is so important here that the region is in fact called the “Food Valley” and gourmet travelers arrive like gastro-pilgrims to the region’s producers. While we offer all manner of gourmet tours in Emilia Romagna including our flagship Gourmet Grand Tour, we are also delighted to launch this new wine tour in a region often overshadowed by its cuisine. Emilia Romagna has many wine appellations, but it’s most famous and many would say infamous DOC (denomination of origin) is Lambrusco. In the best of times, Lambrusco can be a refreshing off-dry red wine that suits the rich local dishes like Tagliatelle Bolognese perfectly. In the worst of times, Lambrusco can be a cloying, oversweet, treacly nightmare. And how sad that the region has gained notoriety for this poor example when there are so many hidden gems! Visit the DOC Colli di Imola and DOC Colli di Faenza and learn about the local grape varietals like the Pignoletto. Taste excellent examples of what Sangiovese, Bonarda, and even Barbera grapes can taste like in this region. Let us show you the best wines in the region on this luxurious chauffeured one-day Wine Tour (or as an excursion from Modena or Parma). And compliment the wine tours with a phenomenal tasting menu lunch at one of this region’s best Michelin starred establishments- no small compliment for a region heavily populated with amazing restaurants! 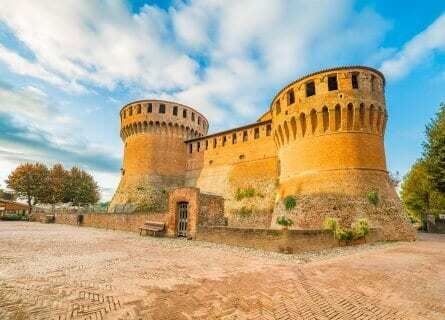 Your private English-speaking chauffeur and will arrive at your hotel in Bologna to sweep you away to the tranquil wine roads of Emilia Romagna. Head southeast to the countryside surrounding the famous ceramic producing town of Faenza, about a 45-minute pleasant drive. Your first stop of the day is to one of the best and most beautiful wineries in the area. The winemaker here studied in Bordeaux and is well known for her Cabernet Sauvignon and Sangiovese blends as well as a delicious sweet “Passito” wine made with the local Albana di Romagna grape. You will be warmly received and enjoy a private tour of the estate followed by a tasting of award-winning wines. After a morning of swishing and swirling wine, you will undoubtedly be getting hungry and we have an outstanding culinary experience awaiting you- lunch at the mythical San Domenico, near Imola. Relax and enjoy a leisurely two-hour lunch with various courses, all paired with top wines of course! 3-4PM After lunch, stretch your legs, get some fresh air and explore the adorable hamlet of Dozza. You will have free time to check out the regional “Enoteca” (wine shop where you can also taste) situated within a perfectly restored castle. Check out the many art murals on the hamlet’s walls and archways, painted by Italian and international artists. Before heading back to Bologna, you will stop at a second wine estate near Imola, only a few minutes’ drive. Family run (father and sons), this little boutique estate will surprise you by the number of countries they export too! Enjoy a private tour, vineyard walk and tasting. After a satisfying day, you will drive on to Bologna and get dropped off at your hotel. This concludes your one-day wine exploration in Emilia Romagna.